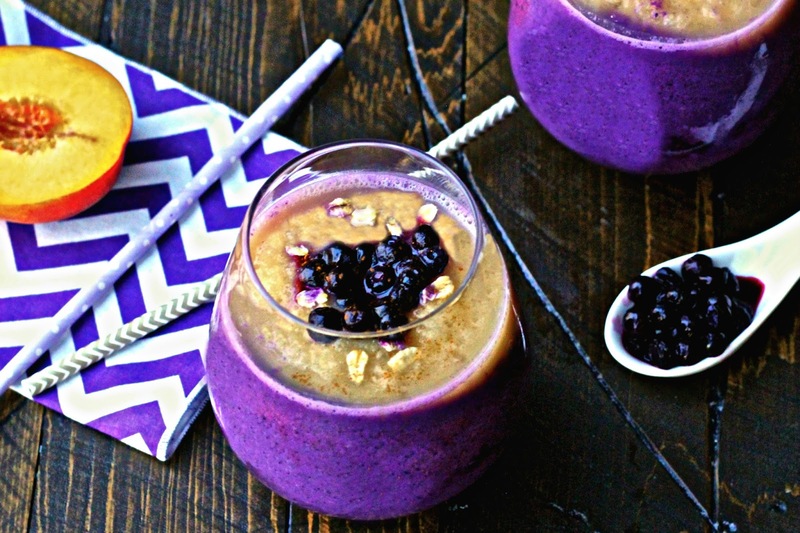 Bursting with nutrition and flavor, Wild Blueberries pack a one-two punch in this vibrant smoothie! Did you know that smoothies are most popular at this time of year in the winter rather than in the summer? It makes sense when you consider that many of us have healthful eating on our minds as we start out the New Year. And smoothies are certainly a quick and easy way to pack a lot of nutritious ingredients into a delicious and portable meal or snack. When I heard about the Wild Your Smoothie Recipe Contest sponsored by the Wild Blueberry Association of North America, I started brainstorming ideas right away. If you’re not familiar with Wild Blueberries, they’re actually different from regular cultivated blueberries. They’re called “Wild” because they are not planted but rather, occur naturally in fields called barrens across Maine and Eastern Canada. They are petite in size and pack a flavor punch. They have an intense blueberry flavor with a mixture of sweetness and some tartness, making them an excellent addition to many recipes. And importantly, they have about twice the amount of antioxidants as cultivated blueberries! Antioxidants help protect our bodies against chronic diseases like diabetes, cancer, heart disease and Alzheimer’s disease. Wild blueberries are frozen at harvest, locking in their nutrients and flavor. You can find them in the frozen fruit section in your grocery store. 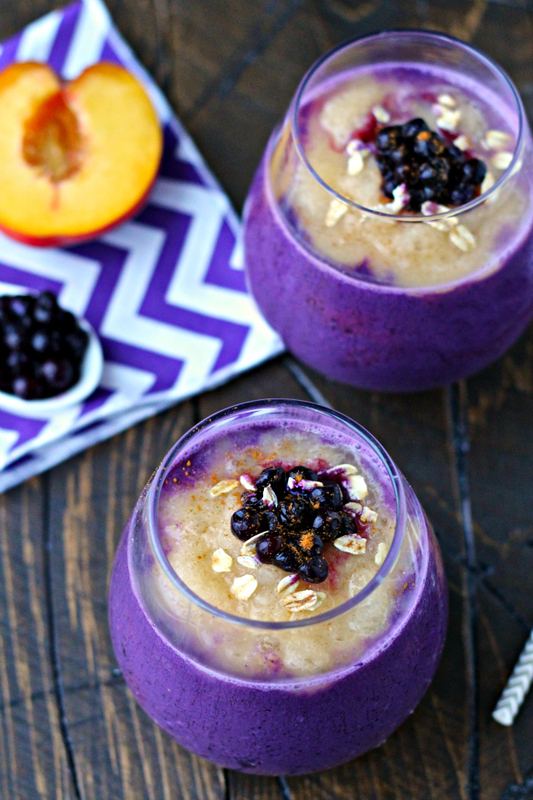 I wanted to recreate the flavors of one of my favorite desserts in a smoothie so I decided to develop a Wild Blueberry and Peach Cobbler Smoothie. I have a soft spot for blueberry peach cobbler and although it’s commonly a summer dish, you can enjoy the smoothie version all year round thanks to frozen fruit. Wild Blueberries are sold frozen and so are peeled and sliced peaches (which also means less prep work!). Blueberries and peaches are a natural pairing. When I make my blueberry peach cobbler, I toss the fruit with lemon juice and top it with a cinnamon-infused biscuit dough that I incorporate ground oats into. This smoothie has all of those flavors that I love and it’s even layered, just like a cobbler. 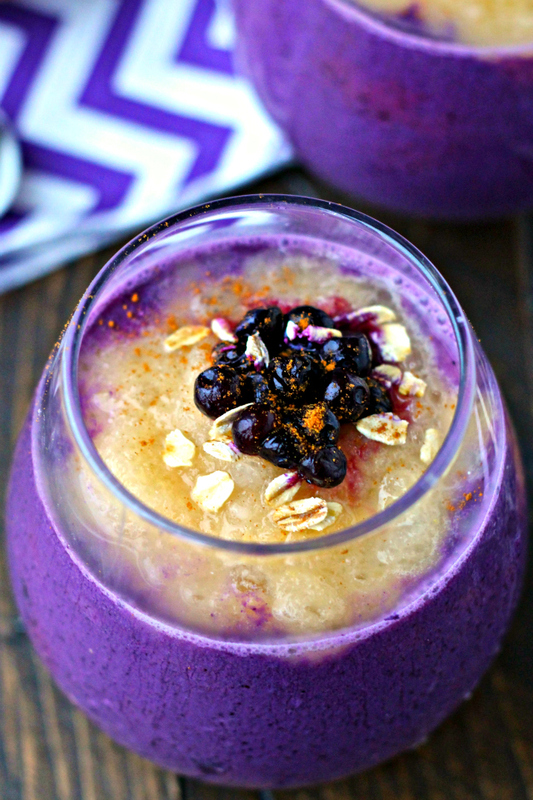 The blueberry layer has Wild Blueberries blended with oats and Greek yogurt, which add a boost of fiber, protein, and plenty of vitamins and minerals. Vanilla extract and cinnamon enhance the blueberry flavor even more. The peach layer adds bright flavor as well as a stunning color contrast. To learn more about Wild Blueberries, CLICK HERE. Also you can follow the Wild Blueberry Association of North America on their social media: Facebook, Instagram, Pinterest and Twitter. 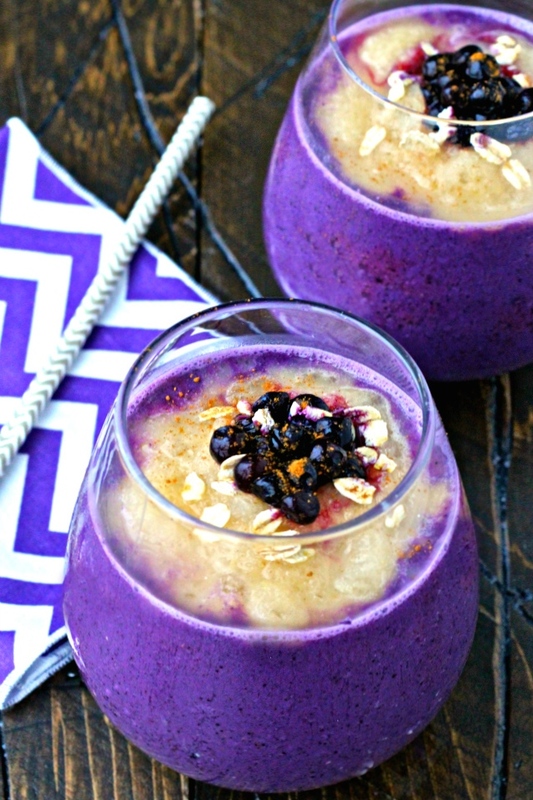 To make the Wild Blueberry layer, blend the Wild Blueberries, ½ cup milk, oats, yogurt, vanilla, cinnamon, 2 teaspoons honey, and ice together in a blender until smooth. Divide it equally between two glasses. To make the peach layer, blend the peaches, ½ cup milk, 1 teaspoon honey and the lemon juice together in a blender until smooth. If using frozen peaches, you may need to add a little additional milk or water to get the blender going. Carefully pour equal amounts into the glasses on top of the blueberry layer, creating a second layer. Sonali, you definitely make a good point like Farrah said – I've been seeing so many smoothie recipes recently – and seeing I adore cobbler, I wish I could face plant into this one! Such gorgeous color on these smoothies! This is so gorgeous!!! Love the color and healthy ingredients!! How fun is that! Feels like summer! Yum! This looks great! 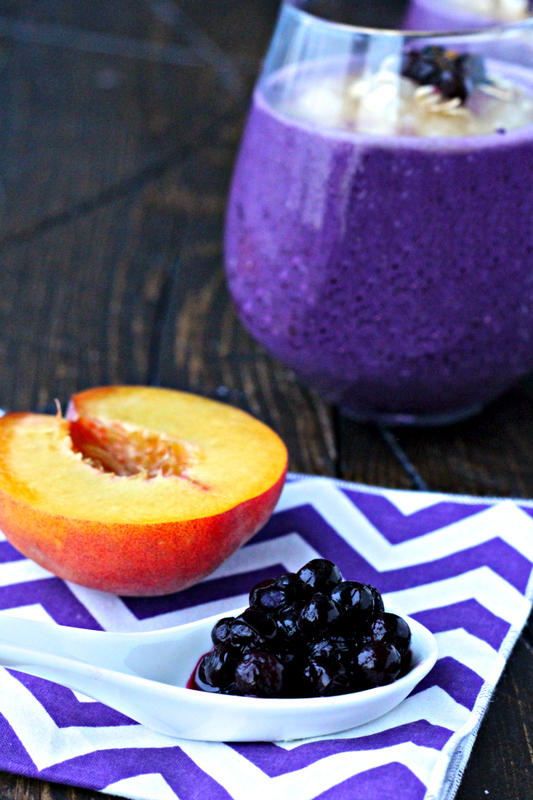 I love the combo of blueberries and peaches – it's like comfort food in a cup! This is SO pretty Sonali, and, I imagine, just as delicious too! I love, love, love Wild Blueberries, and always keep a stash in my freezer. Now I just need to get some peaches so I can whip this up. Cheers! This is such a creative blend and I absolutely love the way you used peaches and blueberries together! I am going to be looking for Wild Blueberries the next time I go shopping. They sound so tasty. 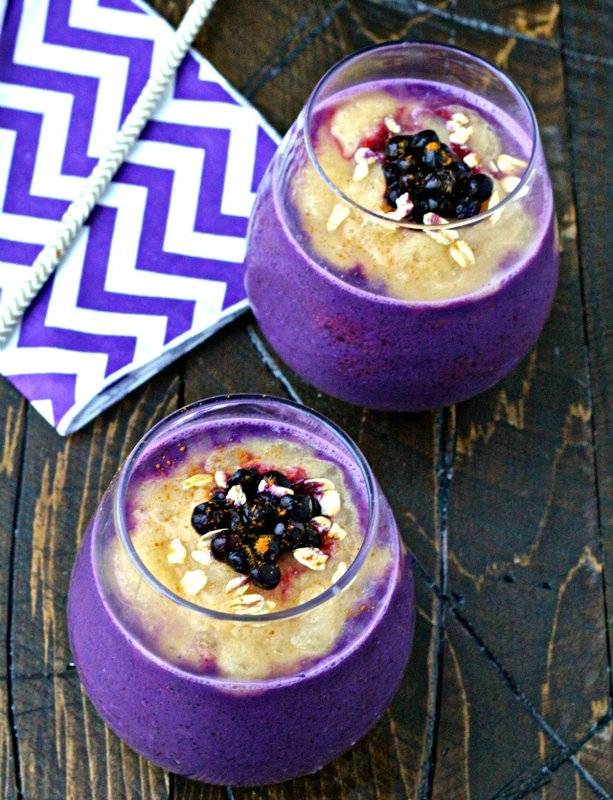 While being a great addition to this smoothie, I love the color! I just had to pop back in and tell you I found them. Thank you for introducing me, I am so in love with this berry!